Many laptop stands feature USB hubs for easily adding accessories to USB ports. However, not all of them feature the hub in an accessible place, thus making the choosing process less obvious. In this article, we’ll help you through the process of finding a suitable laptop stand with USB ports, as well as briefly review two such laptop stands that we think are the best options for laptop stands with USB ports. 1 What To Look For In A Laptop Stand With USB Ports? What To Look For In A Laptop Stand With USB Ports? If you’re looking for a laptop stand with USB ports, it means that you’ll be plugging different accessories into those ports—like a mouse, a webcam, or a keyboard. 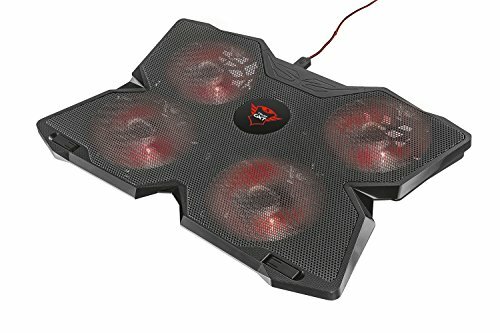 From this we can deduce that you most likely want to convert your laptop into a desktop-like working station, and from this, in turn, that a laptop stand with a rather steep rise is what you are looking for. So the important things for a laptop stand with USB ports are a steep rise that provides a comfortable typing/viewing angle along with easily accessible USB ports. Below are the options we found when looking for a combination like that. The Fellowes laptop workstation is a laptop stand that features an adjustable slope together with a four-port USB hub that’s easily accessible. The laptop riser looks stylish, and, along with holding the laptop (supports laptops with screens up to 17”) steady in place, it also provides additional space for ventilation through the bottom side of the laptop. The Fellowes Workstation isn’t too expensive; in fact, it’s actually a bargain as far as workstation laptop stands go. Trust GXT 278 Notebook Cooling Stand is a laptop stand with a sturdy aluminium inlay. It, just like the Fellowes model, features 4 easily-accessible USB 2.0 hubs, and does a great job of raising the laptop for the optimal viewing and typing experience. Its height is adjustable, and the model sports rubber pads for preventing slippage. 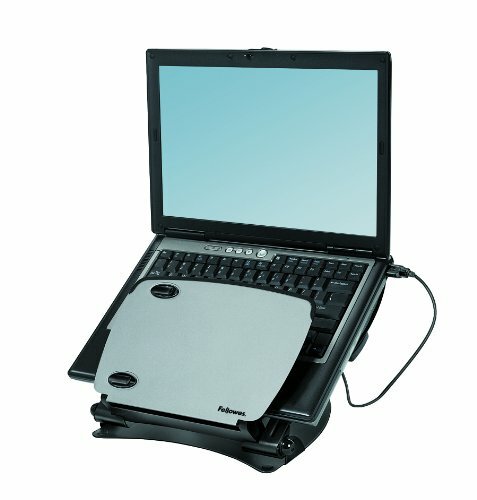 Just like the Fellowes Workstation, the Trust model can hold laptops up to 17”. Both of these options are similar in regards to features, and both can accommodate all sizes of laptop and notebook, making them the best choice when it comes to a laptop stand with USB ports.